We have a digital sweet tooth. It's probably impossible to not fall in love with Candy Crush Saga, the smash hit Facebook game that finally debuted on iPhone and iPad. Broken down into its most basic elements, this phenomenal title from King.com Limited follows traditional match-three rules, but surpasses plenty of imitators with missions that add a wonderful element of strategy to the usual formula. Throw in outstanding Facebook integration that displays friends' high scores at all times, and this is easily one of the best iOS efforts. Candy Crush Saga tasks you with matching three or more similarly colored pieces of candy to make these virtual treats disappear, with the goal of reaching a specific high score to clear the stage, except the developers throw interesting wrinkles into the mix. 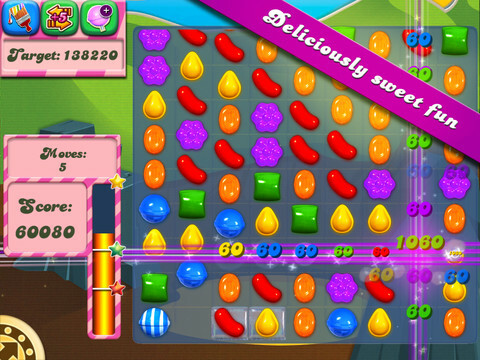 Some boards, for instance, task players with clearing jelly cubes from the play field through matching, while others challenge them to somehow get special ingredients from the top of the screen to the bottom. Here's the catch: you only have a limited number of moves. Once those run out, it's game over. Special power-ups known as Boosters add to the game's complexity. The Lollipop Hammer allows players to smash whatever candy they wish, while multi-colored Jelly Fish swim across the screen devouring sweets that match the sugary creatures' individual colors. Extra Moves, on the other hand, give players five more chances to play with; these are but a few items you'll unlock. 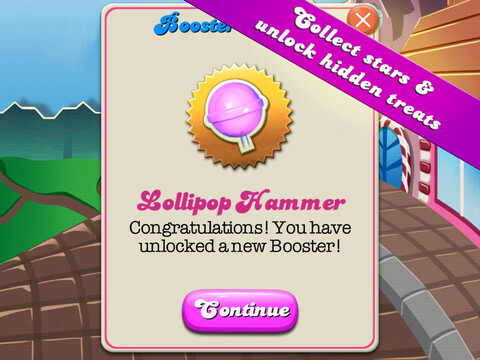 That said, although Candy Crush Saga is free-to-play, you must purchase the Boosters. Not only that, but once you lose a certain number of times, you can buy additional lives, or get some for free by either waiting a certain amount of time, or requesting more from Facebook friends, which is King.com's way of getting users to promote the game. This being the case, the creators never put any pressure on you to spend money, which is a welcome change in the freemium realm. Unfortunately, later stages become extremely difficult without Boosters. As for friend integration, the ability to view current high scores makes the game even more addictive. Depending on who's ahead, taking their top spot will become an obsession. Consider yourself warned. Add high-resolution graphics that'll make you hungry just looking at them, along with happy-sounding music, and Candy Crush Saga is match-three evolved. Quite frankly, we didn't expect to fall in love with this game. Excellent stuff. What's Hot: Match-three gameplay with a twist, brightly colored graphics, relaxing music, game changing Boosters, smart Facebook integration, free-to-play. What's Not: Tough to beat later stages without Boosters.